Chocolate dishes are the easiest ones to make, especially like the Chocolate Burfi I made for Deepavali. After debating much on what sweets to make, apart from the traditional ones, I thought these chocolate sweets are the easiest and not to mention the most quickest to disappear. Imagine I made this the night before yesterday, hoping I can keep some for my nephew and niece who were coming today. And nothing was left. I even got some for my colleagues, who couldn’t believe that this burfi was so easy to make and it was unbelievable delicious.The entire time to make this was just about 10 mins. The actual cooking of the burfi is only 3 -4 mins, that too you got to be stirring along. Infact because I had to click a picture, I left it to Konda to stir and it almost set. So I had to add some more of condensed milk to get it loose. After transferring to the tray, all you need is some 30 mins time or if you are in a hurry, put it into the freezer for a quick fix. Since it was pretty late when I had made this, I cut into pieces the next day morning. So unless you plan to do the same, you can forget this for overnight. Else this needs about 30 -40 mins cooling time. We made kaja last night and couldn’t plan anything else. Apart from this, I had also planned on making some Ribbon Pakodas, as my sil made murukkus. Our relatives came this morning and the breakfast was the regular Idli, Meddu Vada, Sambar and Coconut Chutney. Nothing to beat a traditional breakfast right! Now I leave you to enjoy these Chocolate Burfi, adapted from a recent The Hindu print. We start a new edition of Cooking from Cookbook Edition, with new bloggers joining me. Please do check them out for their cooking from Cookbook! In a non stick pan, dry roast the wheat flour until the flour lets out aroma. Remove and keep it aside. In a thick bottom pan, melt the butter. 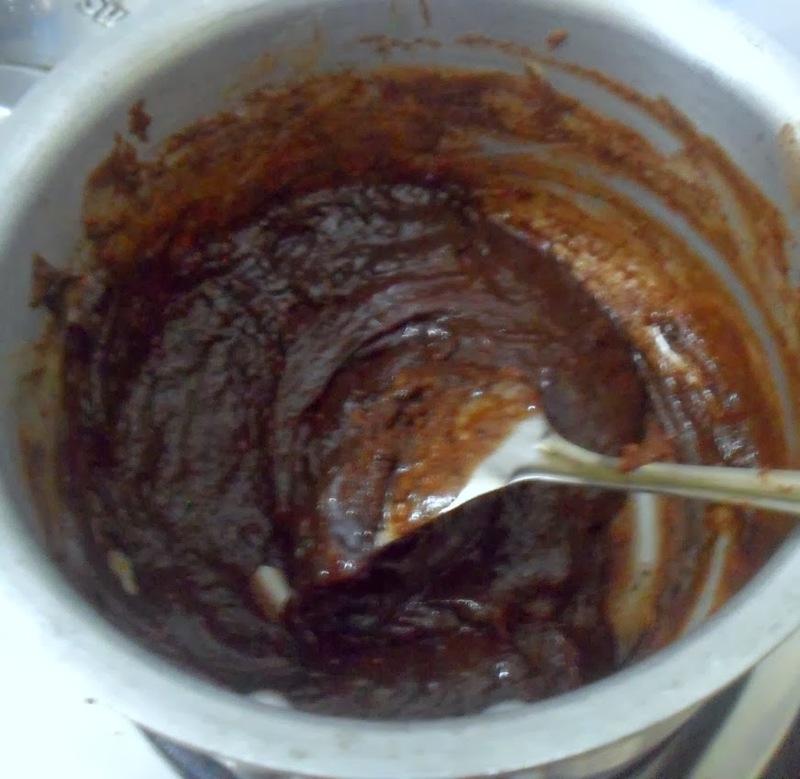 Then add the condensed milk, cocoa powder, and stir again quickly. Then add the wheat flour and stir everything again. Now add the dark chocolate bars. Everything takes about 3 -4 mins and not more than that. Quickly transfer this on to a greased pan and let it set. It takes about 30 mins or more for this to set. Puli Bongaralu | Puli Ponganalu ~ 101 Dosa Varieties! I have no clue why but burfis scare me. Maybe I will take the plunge and try this one? Looks like a pretty easy one to make! Happy Deepavali! O ji can I have some. This is such a quick recipe! And chocolate is an added bonus to try this burfi very soon! looks sinful and so quick and easy..a holiday treat for sure! Looks so easy… gonna try for sure since i am a chocoholic.. Anything chocolate is always welcome! !! A perfect treat on diwali! !! Who can resist to this fabulous burfi,prefect for my sweet tooth. That is one quick and easy chocolate dessert. Will definitely try it out for my chocoholics at home. I saw this recipe too and MIL suggested we make it. I was short of condensed milk so skipped it. Looks very sinful! Looks very rich and delicious! Its easy to make too. I'll make a mental note of this recipe and try it when I get those sugar cravings.